On October 14th we moved Camelot back up to Isthmus Cove for the Latitudes and Attitudes Cruiser’s Weekend. We took a mooring ball and relaxed all weekend with Bob Bitchin and his extended family of sailboat cruisers. 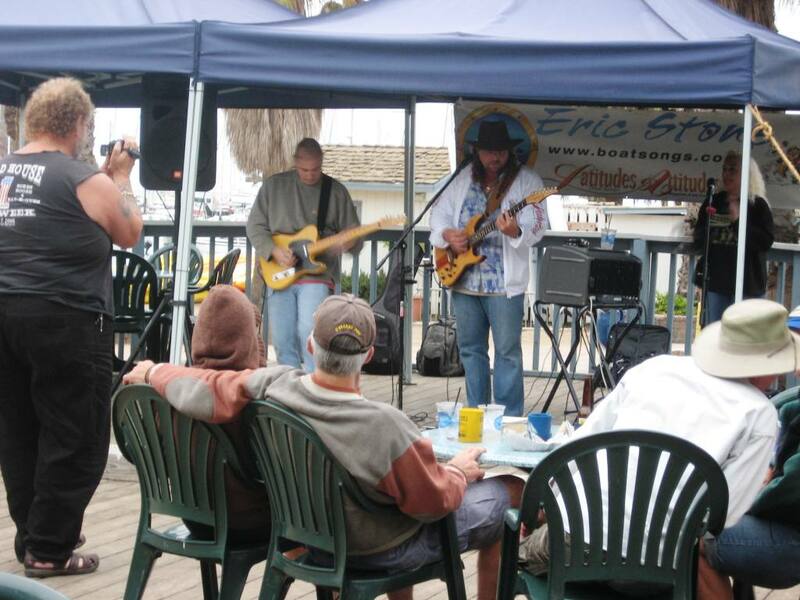 On Saturday, they had a Cruiser’s Pot Luck with Eric Stone and his Band. The party was a great family event and we met many new friends. To my Uncle Tom: yes, I finally had a Buffalo Milk and here is the picture to prove it! 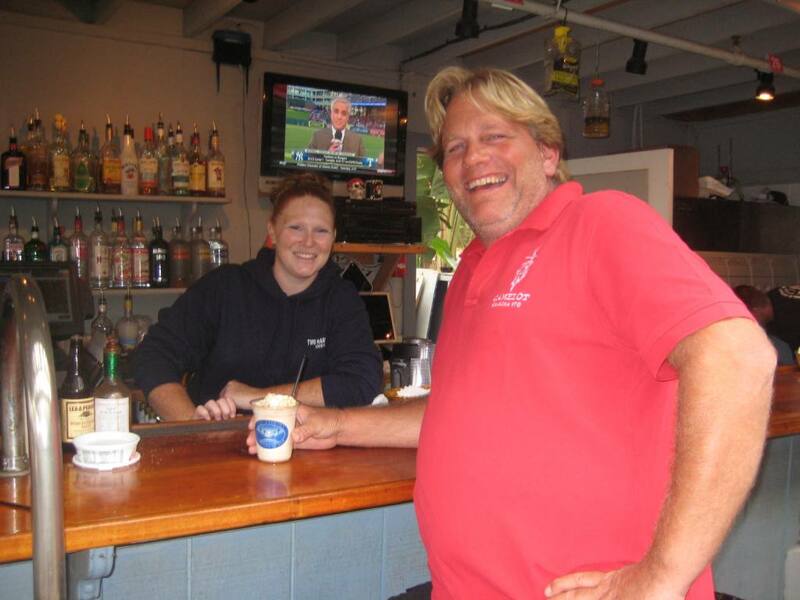 Warning to other naïve perspective victims of the Isthmus Cove Bartender: Buffalo Milk is the local Catalina Island drink named for the Buffalo herds on the island. It is a strange blended concoction of vodka, kaluha, milk and some other clear liquors that tastes great going down, but gives you a buzz before you finish drinking it. On Oct. 17th we got up at 3:30 am (yes, before the sunrise) for the trip to San Diego. It was cloudy with no moon, so the mooring field was incredibly dark. I had Lori on the bow with a million candle power spot light looking for other boats or anything else that would put a dent in Camelot. Everything was going great until Lori turned to tell me something and shot me in the eyes with the spot light. For the next several minutes I think a seeing-eye dog would have done a better job of piloting Camelot. We got out of the Harbor without further incident and began a long motorsail to San Diego. The weather was overcast and there was no wind, which did make the ocean nice and flat. We made pretty good speed and completed the 90 mile trip in 13 hours. As we entered San Diego Bay, we discovered that some industrious fisherman had laid Lobster traps all around the edges of the channel. Although the traps are not a hazard, the 100 feet of floating line with floats (Buoys) that like to wrap around your spinning propeller are. Add in giant kelp (Seaweed), large naval vessels and big power boats… Camelot should have received a Gold Medal in the San Diego Bay Slalom Course. We arrived at Harbor Island and topped off the diesel tanks. Then we took our slip at Cabrillo Isle Marina. We are across from the Airport and can get most anywhere in the dinghy. On Monday 18th, we received news that our beloved Kosmo had passed away in Italy on October 15th. As most of you know, Kosmo was our Old English Sheepdog who Lori got as a 10 wks old puppy in Canada. Kosmo followed Lori in her moves from Canada to San Francisco and comforted her through her divorce. Later, when Lori and I met, Kosmo adopted me as one of the family. After selling our house, Kosmo lived with us on the sailboats for the first 3 1/2 years. Kosmo was somewhat of a celebrity in the local marinas and definitely had his own personality. In Alameda, Kosmo was the official greeter of Gate 11 and it seemed like everyone in Marina Village knew him. Kosmo routinely patrolled the dock and made sure no stray cats or Herons ever trespassed. Of course this lead to several accidental swims that kept everyone entertained. In October 2009, Kosmo became too old to live on Camelot and we moved him to Italy to live with Lori’s brother, Maurizio and his family. Kosmo became a farm dog and sort of an attraction in Maurizio’s home town. 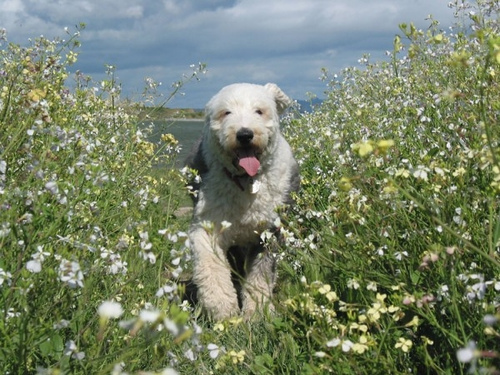 It seems no one in Northern Italy had ever seen a sheepdog and Kosmo received a steady stream of visitors. Our sister-in-law, Marina, walked Kosmo in the fields, provided him with tasty meals and generally spoiled him rotten. Maurizio’s sons, Lorenzo and Giovanni also played with Kosmo daily and even took him to school for show and tell. Kosmo made friends with the other animals and his life was wonderful till the end. Maurizio, Marina, Giovanni and Lorenzo, we thank you with all our hearts for taking care of our friend to the end. We know his loss hit you hard. Later Monday afternoon, we made an exploratory dinghy ride and ended up on Shelter Island. We checked out the local marine shops and stopped by our favorite San Diego Restaurant, The Red Sails Inn. Who could go wrong with a restaurant that has red t-shirt with the motto “Get your Ship Together”. We spent the whole Tuesday in a seminar for Sail Mail, which allows us to send and receive email, weather information and give position reports over the Marine Radio. This stuff is really cool and we should be able to stay in touch with family during our long passages and update the rest of you by sending position reports to our map of the world. We took the dinghy to the seminar and it rained most of the day. Of course when the class let out, we returned to the dinghy and took the 30 minute ride back to Camelot in the pouring rain. We were laughing our butts off the whole way talking about how San Diego’s annual rainfall is about 12 inches, but when WE arrive they get 2.5” in one day. Today, we are renting a car and the provisioning begins. We will stay until Monday 25th, when we start the Baja Ha-Ha Rally into Mexico. Bye bye Cosmo, you were a great dog. Say Hi to Teddy up there in dog heaven. Love reading your posts. Sorry we missed you at cruisers weekend, but the weather was bad in Newport and figured it would be rainy over there…Had enough of that at Pirates weekend. Looking forward to reading about your adventures in Mexico, as we hope to follow suit one day soon…..Don’t leave out a detail. Be safe, have fun. Since you have left we have been getting off late as no one will pull the elevator bell to wake up Dougherty. Joel and Victor give their best. We will talk to you soon again. Sorry to hear about Kosmo , he was always fun to be around while working on the boat. Nothing to wild going on here, had a nice fleet week, got a chance to see the air show from the Saint Francis with Colleen and friends. Today we have light rain and the Ruth Ann cancer drive race out of the Golden Gate yacht club, should be fun. This is a race to where the women steer the boat though two races and we , well, do what were told, lol.